You can easily go with white or yellow vinyl, but why go with plain when you can add style and a professional appearance to your companies sticker needs? Chrome has always been an eye catching finish. We see chrome everywhere as accents on vehicles, appliances, electronics and many other high end objects. If you want your company to stand above others, then deSIGNery’s custom chrome sticker decals are a perfect fit for you! Check out our Spring Sale for savings on Custom Printed Chrome Decals and Custom Chrome Stickers in the following link. 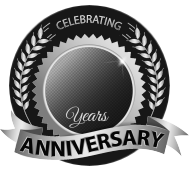 BBB Member since 2004 with a proven record of complaint free customer satisfaction on items like Custom Printed Chrome Decals and Custom Chrome Stickers. Click on the BBB logo above to check our record or leave a customer review. At deSIGNerySigns.com we have more than 24 years experience in designs for our Custom Chrome Stickers. Call us today and let our design specialists help create your next project to promote your product or business. FREE Shipping on all decal and sticker products | Free layout | A+ BBB rating | 24 years in the business | Call Today for a free quote on Custom Chrome Stickers. 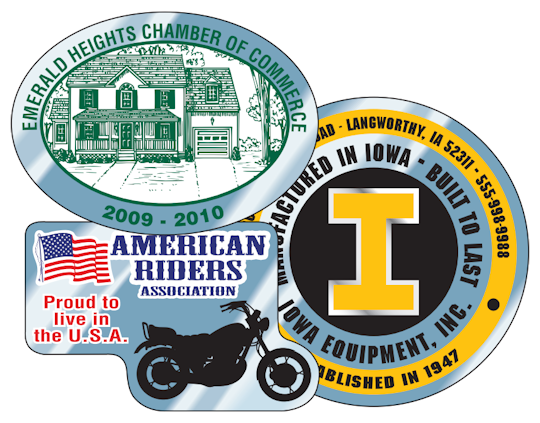 deSIGNery’s custom chrome stickers are made of a polyester material with permanent pressure sensitive adhesive. These stickers are sure to look exceptional on any surface and are guaranteed to look great for many years. The ink used on the chrome sticker is a UV ink which will prevent the ink from fading quickly like many stickers do that you see today. UV ink keeps the decal looking brand new and will also save you from having to order new stickers year after year which will save you time and money. So many options are available for your customer chrome stickers that it will be one of a kind, just for you. You company logo and information is displayed on any size decal. Whether you need a small sticker or a larger sticker, it is your choice! Does your logo have specific company colors? No problem. We are able to match specific colors at a low cost. The sky is the limit and you are your own designer. If at any time you are not sure what will look good or need help deciding, our design team is here to help. A simple layout can be eye catching and easy for viewers to remember. Our company is here to help! Free samples are available for our customer chrome polyester decals. The samples come from overruns of previous jobs done. The variety of samples we have shows the versatility and many different ways that these specific customer stickers are used. A physical sample of a chrome sticker can help you decide whether or not this product will work for your needs. Contact us today on our contact us page and request a free sample and even a free quote while you are at it. Send in your information today so we can help catch the eyes of your future customers!